As we age our bodies produce collagen at a slower rate than when we were young. Collagen makes up a large portion of the connective tissue in our skin and provides the framework that gives us a taut and youthful appearance. The loss of collagen allows skin to sag around our jaw line and cheeks. In many of these cases laser skin tightening can often help a person reclaim the taut-skinned, healthy appearance of their youth. Helps combat weakened elastin and photoaging. 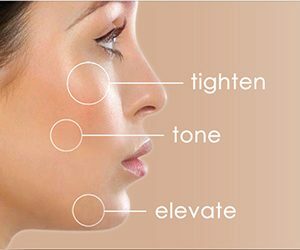 This skin tightening technology has no limitations and can be applied to darker and lighter skin types.